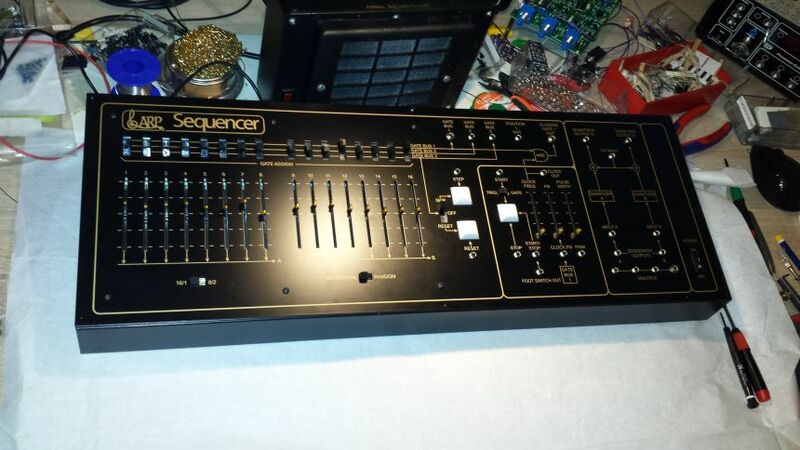 This is the Build Thread for the ARP 1601 Sequencer clone. Everything here relates to the PCB versions up to and including Rev 4. There are some minor changes to the PCB for Rev 4; three DIP ICs which are becoming hard to obtain are substituted with readily available SMD versions. The two extra power supply components are: 1-off 652-RLB9012-120KL and 1-off 667-EEU-EB1H470SH, otherwise the BOM is identical. Added to Round 2 BOM and attached below. Note I did specify 667-EEU-EB1E470SH but that's now out of stock at Mouser until late October so I have substituted it. Mouser BOM direct link: http://www.mouser.com/ProjectManager/ProjectDetail.aspx?AccessID=d547f 3c361 Optional components are marked as such in Customer Part No. field along with notes added to each. This covers all PCB revisions up to Rev 4. Round 2 full Parts List (includes Mouser items) added below. Note that the Mouser BOM does not contain all parts required to build the sequencer - you need the few extra parts listed in the Parts List. Notably this includes two CA3086 ICs, the key caps and 25 PJ301BM jacks (same as TTSH) from Thonk or Erthenvar. The general thread is at https://www.muffwiggler.com/forum/viewtopic.php?t=110640. The PCB is marked with component numbers rather than values as it helps fault-finding if it ever becomes necessary. However almost all of these are obscured by the component when fitted so keep a copy of the PCB layout PDF file. The Build Guide shows a step by step guide to building with photos. This was based on a Rev 1 PCB so there are minor differences between the PCB revisions. The Parts List contains a list of all items required to build the kit. Note that some items are marked as optional - you may omit all optional items only if you plan to use a +/-15V linear power supply of your own. The Mouser BOM contains all the items you can buy from Mouser, but you can of course buy from wherever you prefer. All items in the Mouser BOM are also listed in the Parts List. The PCB layout PDF. You should find it useful when building as every component is tagged with the part number and/or value. The schematic diagram may come in useful but is not necessary. The Service Manual will be needed for calibration and fault finding if necessary. The User Guide will give you some tips on using the sequencer. The Patch Chart can be printed so you can record your favourite settings. 1. 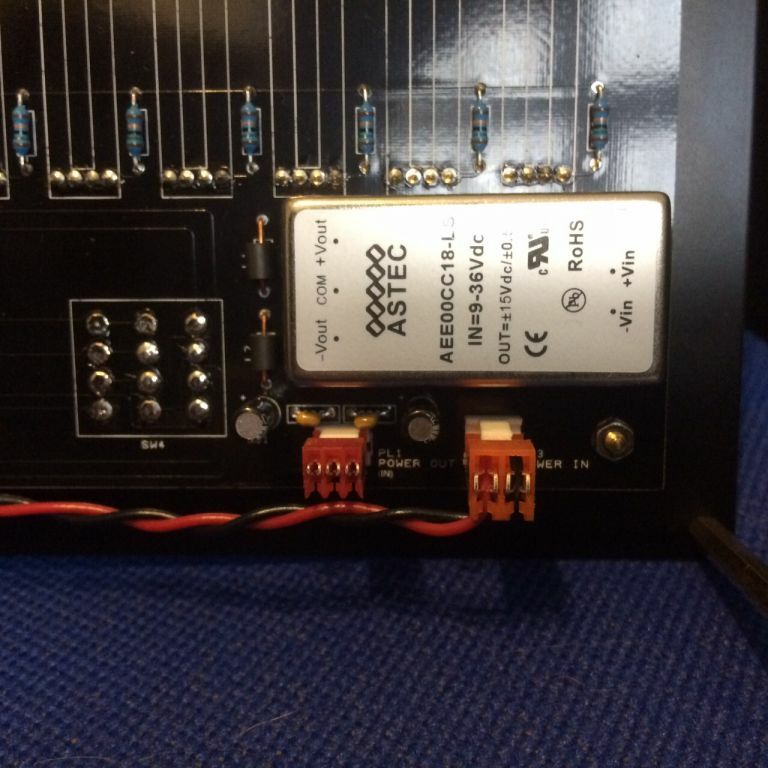 When initially testing the sequencer, ensure that either the Foot Switch socket is connected and wired as per Build Guide, or that the header pins for it on the PCB are shorted, or the start/stop function will not work and it will run continuously in Gate Mode. 2. The 12mm stand-offs can safely be filed or turned down to 11mm, or an extra washer placed on each jack beneath the panel to even up the height a little. 3. The start/stop pushbutton and step pushbutton were both a little prone to contact bounce giving multiple triggers on earlier PCB verions (up to Rev 2). As a result increasing C5 from 10nF to 33nF, and adding a 1nF capacitor soldered directly across the SW1 and SW3 terminals solves the issue. These extra capacitors are incorporated on Rev3 and later PCBs. 4. One word of caution for anyone planning to leave out or change the colour of the LEDs in the 60mm pitch sliders - the LED is part of a chain which supplies a small current to the gate circuits so omitting the LED altogether will cause the gate function to not work, and altering (especially reducing) the current by using a different colour LED may cause it to work unreliably. Red LEDs will not cause a problem but others might. If in doubt PM me and I will suggest some resistor value changes to suit. Further tips will be added as I think of them or they are pointed out by users. thanks for making a new clean thread. looking forward to mine arriving. the resistor and capacitor values are sorted, to make parts handling easier. The kit and boat arrived today and was nicely packaged - many thanks! Seems I always forget a thing or two when starting a new build: ARP 1601 kit & boat - check, hard to find sliders & semiconductors - check, erthenvar jacks and AC power entry module and fuses - oops! 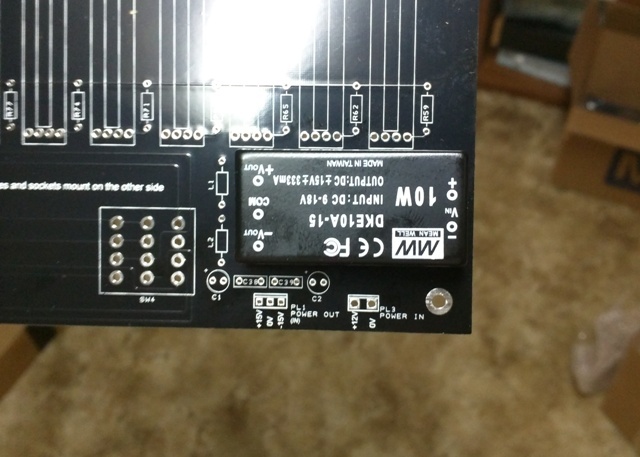 Anyways, I'll get everything else soldered in this weekend while waiting for those tidbits to arrive. A Har ! Seems you are not alone. One or two more items for me to collect too. thanks for the reminder. It's a holiday weekend here in the states so I'm looking at an even further delay before the parts arrive and be able to fire it up and start calibrations. I'll cut out the wooden end cheeks and get them stained to keep busy till then. My first sequencer works fine without any trouble. it was a bit difficult to add the resistors without value silkscreen. calibration task was easy by usage of my keithley DMM and a DSO. It works perfect on a oberheim SEM. A ttsh isnt avaiable due to VCO sync modification. Nice work LED-man! It's also taking me a little time to build but I should be finished by tomorrow. One small thing I have noticed with my build, the 6 spacers were a little too tall at 12mm, I ended up filing mine down to 11mm, which just about matches the height of the jacks and switches. It's only a small cosmetic difference (there is less flexing of the panel near the sliders and switches) but I thought it worth the effort. But then I am a bit pedantic about my builds. I'm not sure that 11mm spacers are even available, but you could always use 10mm spacers with some extra washers for those without metalworking tools. All told though, an enjoyable build so far. I should have some time for testing my build tomorrow, so I'll post some pics soon as well. Thanks - I'll add that to the tips. Please post pics and vids to show them in action. Same as the TTSH - just pass a piece of bare tinned wire through the bead and solder in both ends for L1 and L2. Note the ones in the photo are not the part that's listed in the BOM - I had a load lying around from years back. EDIT: It seems I specified a part that's 14mm long - many apologies. I know ferrite is impossible to cut with normal tools ( a diamond disc would probably do it) so I'll try to identify a suitable alternative. I may be able to help you out. I have a bunch on order. Provided I get the correct items I should have some spare. Once these have arrived I'll get back in touch. Nice to see the wooden sides. I'll be going for a more squared approach. As it looks more suitable. Hand sawn as usual but it will be walnut so hopefully the wood will make up for any wobbly cuts. Thanks, I'll update the BOM ASAP. I've always used mouser # 623-2743002112LF, but Altitudes909's part looks good also. I'll go with the 875-28L0138-80R-10 as the shorter case length will make it easier to bend the legs to fit a 0.4"/10.16mm pad spacing. Thanks for your help on this. EDIT Round 2 BOM and Parts List updated and added to Post #1 above along with direct link to Mouser Project. If you are able to edit the Project (hopefully not) please do not do so, but simply click Order Project and edit your cart instead.